Quick overview Includes stories of patients and their families, details of personal events, comedies and tragedies. This is published in association with the Nuffield Trust. 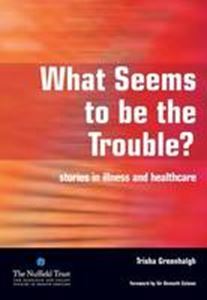 There is a foreword By Sir Kenneth Calman Vice Chancellor, Durham University and former Chief Medical Officer. 'Excellent. [The book's] analytical and methodological approach is invaluable. It is a real privilege to listen to the stories of patients and their families, to hear details of personal events, comedies and tragedies, and to use the skills of listening and interpreting to make sense of the story. I have written elsewhere that the history of medicine is simply the re-classification of disease. Here are some new ways of classifying the issues with which we are faced in an effort to assist in the process of healing.' - Sir Kenneth Calman, in the Foreword.